Eating raw meat and making stone tools may be behind the smaller teeth and faces of humans compared with their ancient relatives. 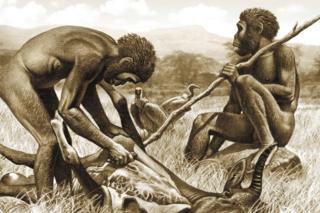 Meat and tools, not the advent of cooking, was the trigger that freed early humans to develop a smaller chewing apparatus, a study suggests. This in turn may have allowed other changes, such as improved speech and even shifts in the size of the brain. The authors conclude that cooking became commonplace much later. Prof Daniel Lieberman and Dr Katherine Zink from Harvard University have published their work in the journal Nature. The earliest members of our genus, Homo, are only sparsely represented in the fossil record. By the time the species Homo erectus appeared about two million years ago, humans had evolved bigger brains and bodies that had increased our daily energy requirements. But paradoxically, they had also evolved smaller teeth, as well as weaker chewing muscles and bite force. They also had a smaller gut than earlier human ancestors. One of the possible reasons for these changes, cooking, did not become commonplace until 500,000 years ago, the researchers found. This means that it probably did not play a significant role in the evolution of smaller chewing muscles and teeth. "If you were to go and spend time with chimpanzees, you'd find that they spend.. about half of their day chewing," said Prof Lieberman. "At some point in human evolution, there was a shift - we started to eat less. This shift is made possible by two factors: we eat a much higher quality diet than our ancestors, but we also eat food that has been heavily processed." The scientists evaluated chewing performance by feeding adult experimental subjects samples of meat, and the kind of vegetables our early ancestors might have consumed before incorporating meat into their diets. They measured the muscular effort required for chewing and how well the food was broken up before swallowing. The findings suggest that by eating a diet of one-third meat, and using stone tools to process the food - slicing the meat and pounding the plant material - early humans would have needed to chew 17% less often and 26% less forcefully. In their paper, Lieberman and Zink argue: "We further surmise that meat eating was largely dependent on mechanical processing made possible by the invention of slicing technology. "Meat requires less masticatory force to chew per calorie than the sorts of generally tough plant foods available to early hominins, but the ineffectiveness of hominin molars to break raw meat would have limited the benefits of consuming meat before the invention of stone tools approximately 3.3 million years ago."